A Sneak Peek into the SaND For Soapholics products I am loving right now! Only a few months back I was a person who was indifferent to the difference a soap made with really good and natural ingredients can make! After coming across Lilac Handmade soaps and Soap Opera soaps I really want to never stop using handmade soaps! I can say that you will be addicted too once you start using handmade soaps and not those mainstream bulk made, commercial soaps ( Sheesh! 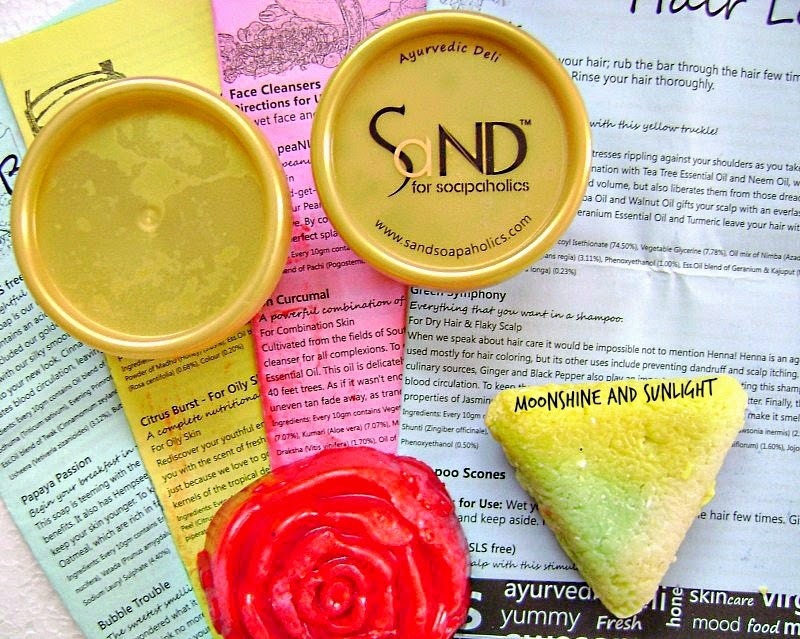 I used to think they were good enough but now I know better ) and when I was searching for some more brands to look for awesome handmade soaps I came across SaND! A few days ago I Introduced you to the brand SaND for Soapaholics when I visited their store, which looks more like and ice cream parlor/ Candy shop ! I was delighted by the product's quality and not the mention the fragrance! ohh the fragrance you get once you enter the store! After a few days of visiting their store I received some of these delicious goodies from them and I must say i am hooked to two and two I haven't used yet! Namak Halal :- This is a salt based scrub. This is mild enough to be used on face as well. This smells soo relaxing! My whole cupboard smells of this ( and I love it *wink* ) Reviewed here. Hair Force :- This is a hair mask and one of their best selling products. I have not tried this yet because I have started using the Nioxin regimen I mentioned about. After two weeks I will be able to try this out. Papaya passion :- The beautiful rose you see is a handmade soap. This is sold at the store by weight in blocks. The people at SaND were so sweet to send this after I said I would Like to try this on their Instagram page! Love them even more now! Mungaru Mallige :- The tri colored triangle you see is a shampoo scone! I am really excited to try this out and this is SLS FREE as well! This is for my hair type, you can order online for yourself at their website according to your type! I will soon update my experience and write a full review for each one of these after some time! And as soon as I finish my AloeVeda Pineapple Shower Gel, I am going to get a bath powder from them named CLEOPATRA, it has goat's milk and is SLS free! It is something fit for a queen and we all know that we all are a Queen in your lives! After all we are the ones #WhoRunTheWorld !!!! !